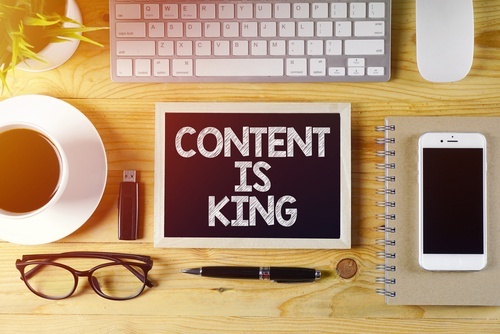 Is It Time to Improve Your Website Content Strategy? You’ve known for a while that your website content is stale. It hasn’t been refreshed recently, and deep down you know it’s affecting your traffic and leads. Now that a large number of businesses have taken to the web to create an online presence, websites are more important than ever—and it is a good way to be found and stand out among the competition. And that means if you’ve put off revamping your website content strategy, 2018 is the time to put it on your priority list. This may not seem like a way to create better content for websites, but it is an essential aspect for today’s on-the-go research. Many people look up businesses on devices other than a computer. This means it is crucial that your website also has a mobile and tablet format. Customers are often put off by sites that don’t quite work on the screen they’re using. If you haven’t made your website multi-device friendly, it should be top of your list. Talk to your web developer, or use a website building platform that automatically does it for you, like Wix or Squarespace. Start by reading articles on what good a website content strategy looks like, then move on to research others in your industry who have done it well. Finding websites you like in terms of layout, design, and content can give you a place to start from. It will help you fine-tune your own goals and give you ideas on how to improve your website. As you look at other websites, begin to think about what makes you unique. This will be key in helping you stand out and target your specific audience. Now that you have some general ideas on design, layout, and content, it’s time to go through your current website content strategy and look at what needs to change. Do you have too many tabs? Not enough? Is your content too long, too short, or vague? Have you left enough white space and added aesthetically pleasing design, graphic, and formatting elements? For each page, write up how you want to improve it (particularly the website content), what can be added, and what can go away. This will also give you a clear picture of the types of content you need and where to start. Now that you know your needs, make an editorial calendar. Decide how long your project should take overall and outline the time for each portion and what is involved with each step. Instructions are important, especially if you’ll be outsourcing the copywriting to a professional. It can be tempting to write website copy yourself, but if you aren’t highly skilled in SEO, editing, title creation, or formatting, it is probably best to leave the actual content creation for your web pages up to the professionals. Look for someone who has extensive knowledge in your industry, experience writing content for websites, and who is communicative and will collaborate with you throughout the process. You’ll provide value for visitors, which may keep them perusing your site longer rather than moving quickly on to the next. You may see a nice increase in traffic. When a website is optimized for SEO and content is appealing, you’ll often see growth in the number of visitors. Your sales may go up. When you offer the right information, it can inspire a sale. Great sites get shared. If you improve your website content, you may become more sharable, which is always a positive. Sharing=more potential customers. Don’t put off updating your website. Better content for websites goes a long way toward reaching your audience and driving more sales. To learn how to develop a content strategy, check out our white paper, "What is a Content Strategy? Any Why You Need One!"